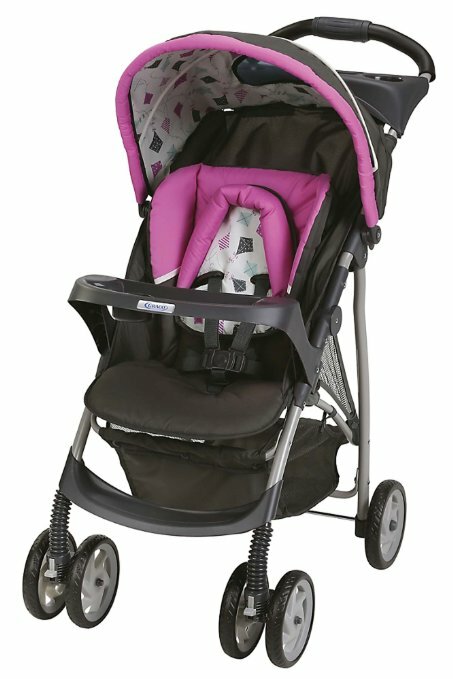 The Graco LiteRider Click Connect Stroller is the perfect stroller for the new on the go moms. 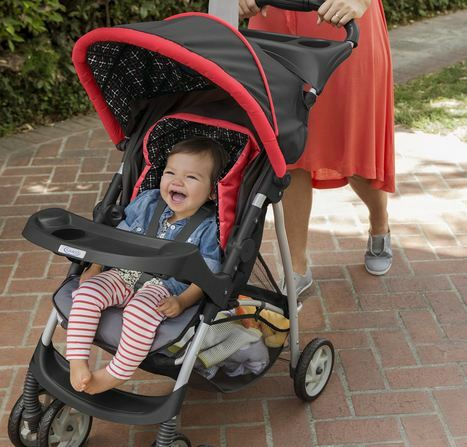 Not only because of its weight capacity of up to 40 pounds but also because it weighs only 20 pounds and thus would be perfect for any new moms who aren’t used to pushing strollers on their daily workout routines. In short this are the high quality baby strollers to start on and use for many years until your baby starts to hit the track too. The stroller requires no batteries to operate and is very much ideal for even the tall babies. This is my second year since I bought one and it’s still sturdy and quite efficient on the track. In these two years I have really fell in love with this stroller. It is very light and weighs only 20 pounds. Because of this it is very much portable and quite ideal for the many moms on the go. It has a one latch hand fold and a storage latch that makes it easy to tag around trips and store in your car’s trunk. Since the stroller can hold up to 40 pounds of child’s weight it keeps my boy comfortable and with enough room to move around and get a position of his own. This is very vital since it helps my kid to remain safe and enjoy the ride. The Graco LiteRider Click Connect Stroller comes with a 5-point harness, a head pad, and a comfortable recline seat that enhances the view, safety, and comfort of my kid during the ride. In addition to that the Graco LiteRider Click Connect Stroller comes with padded handle for easy control while running or walking. 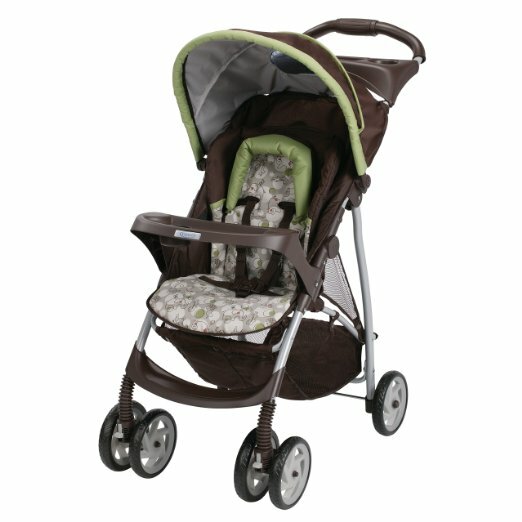 It also has a set of lockable front swiveling wheels for easy control and maximum safety when parked along the terrain. Meaning if you were using it you could park beside the road and still receive that all important call from your husband. The stroller accepts any Graco Click Connect infant car seats with a secure 1 – step attachment. This makes it very easy for anyone using it to create their own travel system. The other features include the following, an all wheel suspension, an extra large drop down storage basket, a parent tray storage compartment with 2 cup holders, and a removable child’s tray. The suspensions are awesome for making the ride smooth and lulling the baby even on the most uneven terrains. Because my Graco LiteRider Click Connect Stroller came with a fantastic storage compartment and parent tray, I don’t usually worry about how to carry my lunch, drinks, and baby diapers along the runs. In fact the kid’s tray always makes it easy for my boy to have a bite of his favorite snacks while we take a few rests from time to time. In addition to that, the Graco Click Connect infant car seat also makes it easy and quick for me to arrange any car errands such as home trips and shopping. If you love your kid like I do my mine this is the excellent lightweight stroller for you. Finally the adjustable canopy will protect your kid from the harmful sun ray’s, wind, and any light drizzle along the run. The Graco LiteRider Click Connect Stroller accepts all the top rated Graco Click Connect infant car seats. It comes with a “click” meaning you only have to place the Graco Click Connect infant car seats and it’ll “click” to let you know if it’s secured. It also works well with many other car seats such as Chicco. However if these seem a little on the higher side, you can still purchase a compatible adaptor or simply strap up your little man on the car seat. In addition to that the LiteRider can also work well with the BOB baby diaper bag and also an under seat cooler bag that allows your drinks to remain cold all through the ride. The Graco LiteRider Click Connect Stroller is awesome for any sporting new moms to be. If you want to spend some quality time with your kid and also get back into shape, this will be the great travel stroller for you. It is big enough for any kids, strong for up to 40 pounds, and sturdy for even the roughest rides. It is the 5-point harness, all round suspensions, and the padded handles that win me over. They are great for your baby’s safety and comfort all through the ride. Since the Graco LiteRider Click Connect Stroller is designed to only accept Graco Click Connect infant car seats, it could be tough to find an option that fits just in case the customized car seats are expensive for you. The wheels are also small and this could sometime make it a little uneasy to use on terrains that have many potholes and uneven ground. Since the front wheels come in two sets it means they will be unevenly damaged and this could spell more repair costs. The Graco LiteRider Click Connect Stroller has ideal suspension that makes my boy comfy even through bumpy rides. Its 5-point harness ensures safety for my kid even on hilly and valley rides. And because it has a kids tray my kid can have the perfect place to hold his drinks and food. The canopy will also be perfect in adding protection from all weather forms. Compared to many other strollers of its kind, I would say that at reasonable price Graco LiteRider Click Connect Stroller is a real bargain. I really love my LiteRider and would use it for my next kid now that I’m due in six months. The reclined seat hasn’t left my boy with any complications and that only makes me more confident of using it again. The costs might differ from vendor to vendor but if you asked me, I would confidently recommend this cheap stroller for you. Buy the Graco LiteRider Click Connect Stroller and enjoy the multiple features it has including the one step secure attachment.